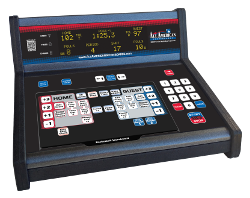 Due to the continuing advancement of technology and the rising number of parts that are becoming obsolete, the 2000 Series Scoreboards from All American and Everbrite can no longer be supported by our technical support team. We have developed this page to address solutions to some common problems that our valued customers may have come across in the past 20+ years. We hope you find this information helpful, and we hope that you consider All American for your next scoreboard purchase. Scoreboard does not respond to the console. Always disconnect power from scoreboard before servicing. The most common issue for our 2000 scoreboard is the result of a single LED located on the receiver board (located behind the service panel of the scoreboard). This LED was intended to supply valuable troubleshooting information. This LED, however, was prone to shorts. Once we detected the problem, we began manufacturing our scoreboards without this LED installed. If your console does not communicate with the scoreboard - or it loses communication to the scoreboard after a period of time - this LED is the likely culprit. Disconnect power to the board and locate the receiver board. If you see a Red LED (located next to the wires soldered directly into the board), simply snip the leads of the LED and remove close to the solder joint, breaking the connection. Check all chips on the receiver board to ensure that they are seated correctly. If any pins or connectors are loose or folded under the chip, carefully remove and attempt to reconnect. Reinstall service door and power up scoreboard and console. Enter code and test scoreboard. Still not fixed? Check data cable for any stress points or defects. This cable is still used by All American, however you may need to use existing pins and connectors inside your console if you choose to replace. Please note that this cable supplies data to the scoreboard and power from the scoreboard to use in the console. Entire digit is out after replacing a lamp. It is extremely important to disconnect the scoreboard from power prior to any bulb replacement. Before disconnecting power, take a picture, sketch a diagram or mark the broken bulbs with a marker to ensure that the correct bulbs are removed. Removing light bulbs with the power on is dangerous to both you and the scoreboard. Failure to disconnect power can harm the resistors behind the digits, causing the digit to fail. Because of obsolete parts, once the digits are bad, repair can be difficult. The best way to avoid this problem is to avoid the cause of this problem.